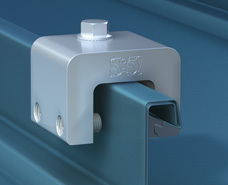 The S-5-H clamp was specifically developed to securely and cost-effectively accommodate metal roof panels with a horizontal seam. The S-5-H is unique in that it allows for attachment to a horizontal seam on the vertical leg of the seam. The clamp's two-piece design allows it to be installed anywhere along the length of the rib, making installation fast and easy! Just place the clamp on the seam, slide the insert piece into place, and tighten the setscrews. After the clamp is installed, affix ancillary items using the top stainless steel bolt provided. 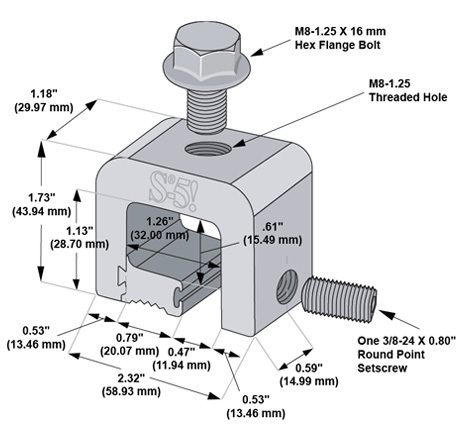 The S-5-H and S-5-H Mini clamps are each furnished with the hardware shown below. Each box also includes a bit tip for tightening setscrews using an electric screw gun. A structural aluminum attachment clamp, the S-5-H is compatible with most common metal roofing materials excluding copper. All included hardware is stainless steel. *S-5! mini clamps are not compatible with, and should not be used with S-5! SnoRail™/SnoFence™ or ColorGard® snow retention systems.